Homemade cream puffs with wow your guests and they're so easy to make. 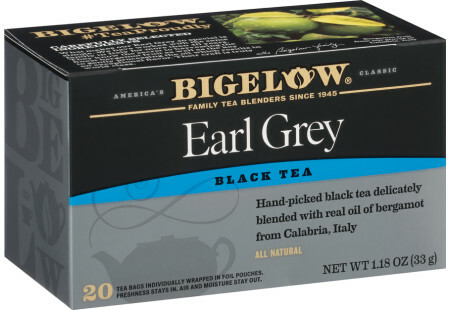 Add Bigelow Earl Grey Tea for that extra Royal flavor. Preheat oven to 425° F. In a medium saucepan, pour boiling water over tea bags. Let steep 10 minutes. Remove tea bags, squeezing out liquid. Add butter and bring mixture to a boil. Remove from heat and immediately add flour all at once. Stir vigorously with wooden spoon. Return to medium/low heat and continue to stir until mixture pulls away from sides of pan, about 1 minute. Remove from heat and add eggs, one at a time, beating well after each addition. The dough will be smooth, slightly dry and thick. Spoon dough onto greased baking sheets forming 6 large puffs. Bake 15 minutes, reduce heat to 400° F and bake an additional 15 minutes. Cut a slit in the side of each puff to allow steam to escape; turn off oven and let puffs rest 10 minutes. Remove puffs to cool on wire racks. Cool completely. Slice shells in half horizontally. Remove dough from inside. Fill with Royal Cream Filling. If desired, sift confectioners sugar over puffs. Serve immediately or refrigerate up to 3 hours. Royal Cream Filling: In medium bowl, pour boling water over 2 Bigelow Earl Grey tea bags; let steep 10 minutes. Remove tea bags, squeezing out liquid. Stir well-chilled heavy cream. Add 1 package (3.4 ounces) instant vanilla pudding and pie filling mix. Beat with wire whisk 2 minutes until slightly thickened. Chill until ready to use. May we suggest English Teatime Case of 6 boxes - total of 120 teabags to pair with this recipe?